To roast the pork: Preheat oven to 425º F. In a small bowl mix 4 tablespoons olive oil with 4 minced garlic cloves. Place the pork shoulder in a roasting pan, preferably with a rack in the bottom. Brush the garlic oil on all sides, then sprinkle all sides evenly with kosher salt and pepper. Roast for 20 minutes then reduce heat to 325º F and cook until an instant read thermometer inserted in the center of the pork reads 185º F, which will take a few hours. Remove from oven and let rest for 30 minutes. Shred and set aside. To make the soup: Prep the onion, carrots, ginger, garlic, chile (if using), mushrooms and cabbage before you start to cook. Heat 2 tablespoons of canola oil in a large pot over medium-high heat. Once heated add the onions and carrots. Cook until they start to brown. If pan seems too hot while the onions and carrots cook, adjust heat to medium. Reduce heat to medium (if you haven't already) then add the ginger and garlic. Cook for 1 minute. Add 2 tablespoons canola oil, then add the mushrooms and cabbage. Stir in the soy sauce, then add the chicken stock. Cook for about 10 minutes. At this point taste the soup and see if it needs additional salt. I added ½ teaspoon of salt at this point. In a separate small pot, bring about 2 cups of water to a boil. Cook udon noodles for 2 minutes then drain. Divide noodles into 4 bowls. Add shredded pork (or meatballs, if using) to the soup and cook for a few minutes, just until meat is heated. Fill each bowl with soup. 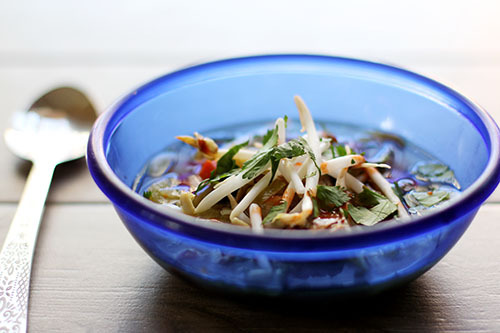 Top with cilantro, bean sprouts, lime juice. Cora and I leave the habanero out of the soup so the kids can eat it, then use Sriracha to add heat to our own individual servings. My kids didn't love the udon noodles. I think ramen noodles would be equally as delicious in this soup. 1 package of ramen (without the flavor packet) would probably be enough for the entire pot of soup. It is best to serve and store the noodles separate from the soup. You could in theory cook the noodles right in the soup. Cora said she stored the noodles in the soup for leftovers and they were okay, but it was definitely better keeping them separate.